Pictured above is my very own right arm, bearing the unofficial symbol of the Kenyon Review writing programs. I'm always up for more reports of authors' tattoos. I'm proud to hear Dorothy Parker had a star on her elbow. Great article, TheElegantVariation (and thanks, Sergei, for the link!). 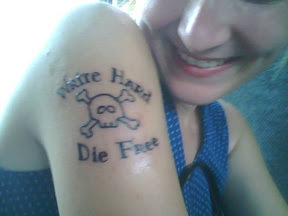 Livejournal, in its infinite wisdom, has a community for literary tattoos. Glad to hear others feel so devoted to words, they want them literally under their skin. My favorites are: the definition of bibliophile, Margaret Atwood's "You Fit Into Me," and simply the word "to." My favorites are usually the ones you can change for seasons or quotations you can alter. I dress my tattoo up for Halloween and Christmas. I have plans for Easter. Hurray for ink!